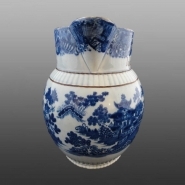 View of the opposite side of the jug which displays the date "1806". Further view of the jug revealing more of the printed Tall Door pattern. 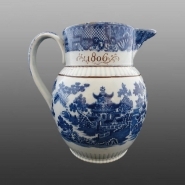 A rare engine turned pearlware dated jug printed in blue in the Tall Door pattern with a brown enameled name "John Griffiths" on one side of the collar and the date "1806" on the other side. Brown enameling has been added to the rim and to the body of the jug.